Enjoy an evening stroll in downtown Brevard, NC as you explore the art galleries, art stores, retail stores and restaurants that are staying open late from 5 pm -8 pm on the 4th Friday from April – November. (December Gallery Walk is held on the 3rd Friday due to the Holidays) Experience art, music and wine. Be sure to look for the animal sculptures and the murals located in downtown Brevard as well. Make an evening of it and stop by and have dinner in one of our downtown restaurants. A brochure for the gallery walks can be found at any of the participating galleries or at the Brevard/Transylvania Chamber of Commerce. For more information call the TC Arts Council at 828-884-2787 or go to www.artsofbrevard.org and click on Art Tours. 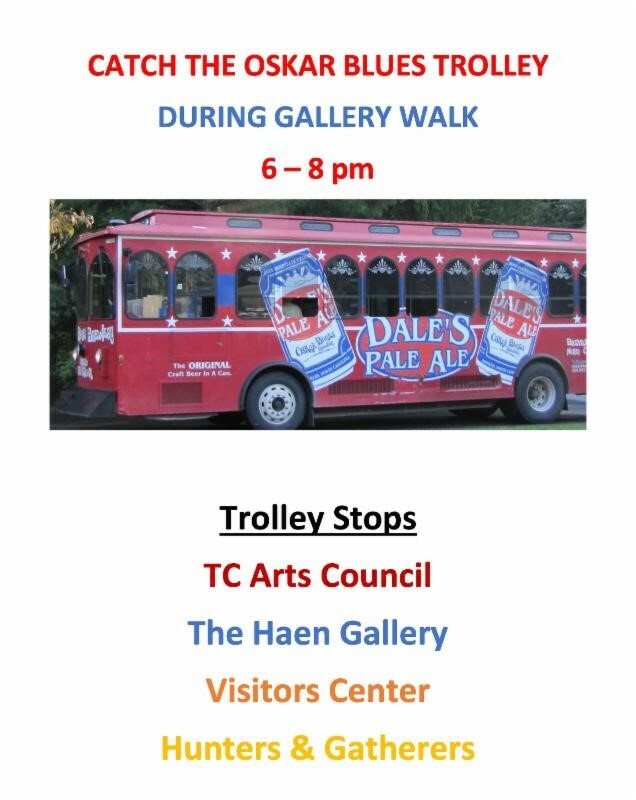 Hop on board the Oskar Blues Trolley, which will run from 6:00 pm – 8:00 pm with stops at the Visitor Center, Hunters & Gatherers, The Haen Gallery/Brevard Lumberyard Arts District and the TC Arts Council Gallery. The trolley does continuous loops from 6:00 pm – 8:00 pm. * The TC Arts Council will feature a new exhibit entitled: ART SPARK – ignite your passion for the Arts! AND they will host their Annual Meeting from 5:00 pm – 5:15 pm. * Red Wolf Gallery is proud to feature the work of internationally known artist and owner of Red Wolf Gallery, Ann DerGara. * Trade-Arama Folk Art & Antiques will be featuring the new artwork of Cecel Allee. * Drew Deane Gallery – explore the artwork of gallery owner Drew Deane from Route 66 paintings to her new jewelry line. * Number 7 Fine Arts and Crafts Gallery will feature the artwork of three of its members for gallery walk: John Davis (oils), Sue Hershey (photography) and Nancy Rosenthal (clay). * The Haen Gallery will feature its exhibit “ARTICULATIONS,” which features a dozen sculptors. * Twelve year old local Brevard artist, Alana Merrell, will be featured at The Gallery at 44 located above Jaime’s Creole Brasserie. * Gravy will be open and a percentage of proceeds are donated to The Cindy Platt Boys and Girls Club of Transylvania County. * Local Color invites you to come in and check out the always changing selection of local jewelry, arts and crafts from over 80 artists. * Hunters & Gatherers – enjoy a glass of a cold, crisp Dreamsicle Punch while listening to Jeff Orr and his blend of Americana music! * Main Street Ltd. will host a free wine tasting with Jessica Guffey from Empire Distributing. * The Hollingsworth Gallery will feature the artwork of the Transylvania Art Guild. * Collective will host a Pop Up Market during gallery walk. Items include: jewelry, original arts and crafts, live music and much more. * D. D. Bullwinkel’s will be serving beer, wine and their famous pimento cheese, as featured in Southern Living. * Theophilus will host a surprise 40% off slash sale from 5 pm – 8 pm only. Gotta get in to check it out! * Broad Street Wines will be hosting a free wine tasting and have musical entertainment by Mike Sweet. * The White Squirrel Shoppe will feature their signature Mimosa’s and shopping. * For Oskar Blues beer tasting stop by Underground Salvage. New for the July Gallery Walk – in the Brevard Lumberyard Arts District: Art, music, food, and fun at Lumberyard Studios, 145 King St. There will be an opening reception July 24, from 5:00 pm-9:00 pm, for the new additions to the expanding Lumberyard Arts District. The 4 working artists, Cathy Goden, Erin Jones, Jenni Barron, and Sue Huggins will be opening their studios to the public for this July’s Brevard 4th Friday Gallery Walk. There will be current and in-progress work ranging from oil and acrylic paintings to drawing and illustrations, sculpture, and textile-based installations. Come join in the fun! Be sure to visit another new studio, Faulkner Woodworking, located at 159A King Street featuring a tool demo from 6:00 pm – 8:00 pm during gallery walk. Then at 8:00 pm listen to music by Passerine at 185 King Street. The Gallery Walks are scheduled for the 4th Friday of every month April through December. (December gallery walk is December 18) For a guide to the gallery walks stop by any participating location or go to www.artsofbrevard.org and click on ART TOURS. For more information call the TC Arts Council at 828.884.2787.